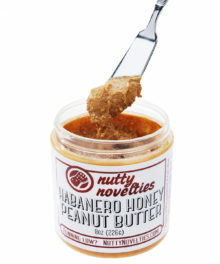 Note: The product details shown on Vat19 (including price) may vary from what is available at the store(s) above. The world's greatest strategy game just got better with Three Man Chess. 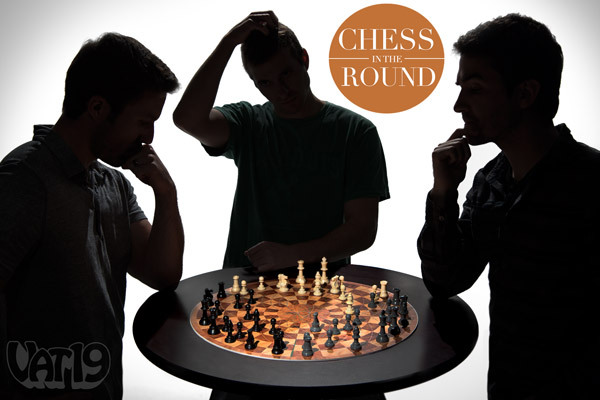 An ingenious circular board featuring a center "zero space" allows three players to duel it out without sacrificing any of the rules of traditional chess. Lateral moves sweep around the arc of the board, enabling sneak attacks. A diagonal piece can pass through the center and with a clear path can even return to its starting position. And a single move can result in the checkmate of both your opponents! Three Man Chess includes a fold-up board and three sets of pieces. 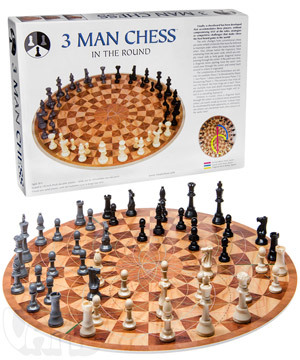 Expand your circle of friends with Three Man Chess! Chess is one of the world's most popular games, but not much about it has changed in the last millennium — until now! 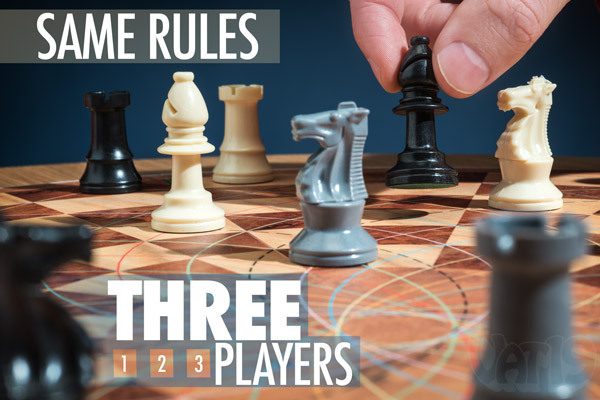 Three Man Chess adds a third player (along with a healthy dose of new and complex strategies) while carefully preserving the rules of traditional chess. Bravo Three Man Chess creator! The addition of a third person adds an exciting new layer of intrigue to traditional chess. In Three Man Chess, all traditional piece movements have been retained. However, the circular board makes it possible for a laterally-moving piece (such as a Rook) to arc around the board. And diagonal moves can loop into the center "zero space" from one direction and exit it traveling the opposite way! Simply put, there's some wild stuff going on in Three Man Chess. To assist with diagonal movements (especially through the center "zero space"), simply follow one of the colored trajectory lines passing through the piece's starting position. the circular board introduces new and interesting strategies. You don't have to learn new rules! Three Man Chess was designed to preserve the rules of the game you love. If you can play regular chess, you can play Three Man Chess. All you need is two friends. If that's a stumbling block, we've got a website full of bribe-worthy awesomeness that could help with that! The only functional difference between traditional chess and Three Man Chess is the inability to laterally attack your neighboring opponent from the back two rows on the board. Despite the similarities in rules, the third player creates an exciting new twist on traditional chess. For instance, you could put both your opponents in check on one move! And with each move, you need to simultaneously defend against and plan attacks upon two opponents who surround you. It's all about the strategy, son! A third player creates new possibilities of alliances, backstabbing, and duplicity. 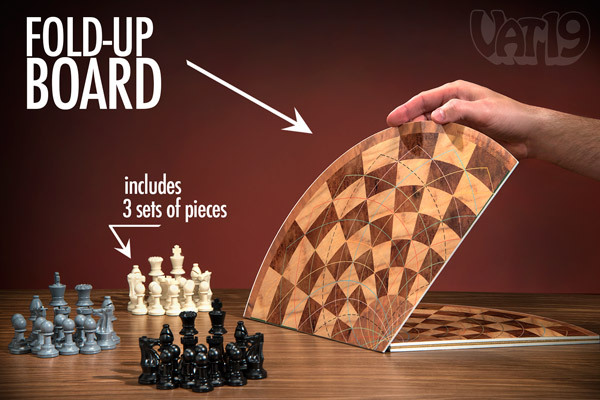 Three Man Chess includes a high-quality fold-up board and three sets of plastic pieces. Three Man Chess includes three sets of pieces and a large fold-up board. Question: Why isn't it called Three Woman Chess? Answer: We believe the manufacturer intended "man" in a gender-neutral sense. Chess, and obviously Three Man Chess, is a gender neutral game. Question: Is it difficult to learn how to play? Answer: Not at all! If you already know how to play chess, you can learn Three Man Chess in a matter of minutes. If you don't yet know how to play chess, we suggest you also buy Solitaire Chess. Cross promo, baby! Question: What if I don't have two friends? Answer: Then find two enemies. Question: Is Three Man Chess 50% more nerdy than regular chess? Answer: Smart people play chess. And being smart is the coolest thing in the world. Buy Three Man Chess and exercise your brain. It'll be fun and it's darned good for you. Sorry! We're sold out until April 24. More stock arriving on April 24, 2019. Burning Questions: You ask and we answer! In what order do the colors move? White, then gray, then black. Can the board rip easily? No. The board itself is made of very sturdy plastic material like most other game boards. Is there a instructions manual? Yes, the instructions are included. It'd be pretty lame of us to sell a new game and not explain how it's played when you get it! Will you put up a video? It looks kind of confusing. How do you win? Do you HAVE to checkmate them both with the same move? I feel as if that would make the game almost impossible to win. Yes, to win you must checkmate both teams. It's difficult but it's far from impossible. How old can you play three men chess? There is no age limit. You just have to be old enough to know the moves and know not to eat the pieces. If one player is eliminated, do his pieces get removed from the board or do they stay there as "barriers" you have to strike trough? When/if a team becomes checkmated, that player is out. ALL remaining pieces remain on the board dormant. They lie as dead fossils, without even a decent burial from the useless government they once supported. 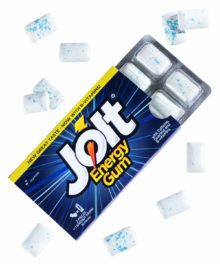 The square that one of these corpses consumes may be captured by another team's piece if it wishes to occupy that square. How do you upgrade your pawns? It depends on the rules you prefer, as pawn upgrades vary from game to game, but as always it would happen when you reach the opponent's side. Can the Knights attack on the first turn since there next to each other? No. Between each army is a "moat" which cannot be crossed. 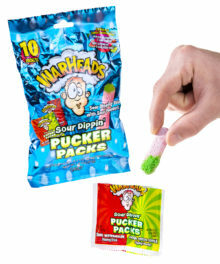 This eliminates the possibility of taking pieces right away. So, if only one player is in checkmate, does that player still get to continue moving pieces until another player is in checkmate as well? The rules of checkmate are still the same. If your opponent is defeated, they're out of the game. Please note that the included instructions are very comprehensive. The knight is the only peace that can jump does that mean it can go through the green marker? No. No piece can cross the green border/moat. How do you win? If you have 1 king in checkmate but not the other what happens? You keep playing until there is only one king/army remaining. In the video when demonstrating the diagonal move you break a rule. You show a piece "turning the corner" on the outer file. This is clearly stated in the included rules as not allowed. Please explain how I misinterpreted the rules or fix it. Thanks. Our mistake! Unfortunately we cannot change a video once it has been uploaded. Thank you for the observation. Can't we make this board and buy 2 sets of chess then color white to gray? Theoretically you could do that with any board game, but why would you want a shoddy hand made version printed on old cardboard when you can have the real thing? Could you play checkers on this board? Not that we're aware of. Checkers and chess really aren't similar at all. It's possible, but a regular chess board would work better. Are those chess pieces plastic? And if they are plastic, what kind? Yes, the chess pieces are made of plastic and have felt bottoms. It's the same sort of plastic used to make most entry-level chess sets. I really want this, but I'm not sure about the shipping, if I buy this i will have to pay the cheapest one, the $9.47 thing XD it's really sure? I mean, i'ts really safe? Of course! Lost packages are exceptionally rare, and even in that worst case scenario it's important to remember that all shipping methods are insured against lost or damaged orders. Does the pieces still work the same as normal chess? Yes, the individual pieces still have the same movements, however there are a few changes to the protocol which dictates these movements. The included instructions include concise descriptions of the changes. Is it anymore difficult than regular chess? Not necessarily. How difficult it is really depends on how good your opponents are. It's difficult to tell from the photos, however there is a thick green line where each team's army is connected that acts as a moat which they cannot cross. This "moat" means that Rook cannot just start tearing to the left or right and taking out opponents right away. "3 Man Chess is set up in much the same way as regular chess; players position their pieces in the 8 square wide sections between moats with all three players' queens starting on the black squares and their kings on the white. White always moves first, followed by gray and then black in a clockwise direction." In normal chess the queen goes on its color. In the video, the white queen was on a black square. Can you place the white queen on a white square? And, where does the gray queen go? The arrangement of the pieces is exactly the same. What you saw in the video was more than likely an oversight after having set up the board over and over again over several days of shooting. How do you win? Do you mate someone with a move and they are out? Then finish off the other guy? That's how it's like in a 4 man chess thing I have in my house. The rules are exactly the same as regular chess. When you mate your opponent's king they are out of the game. If you get one side in checkmate could you move the piece that ended it for that side or is it locked in place until the game is fully won? Only your opponent's pieces are "dead" in that situation. You are still free to move your pieces as needed. Moving the piece that triggered the checkmate does not allow the defeated player to continue playing, so that piece is still in play. Are there any large tournaments for 3 man chess? We're not aware of any, but that doesn't mean that you can't start your own tournament! Are pieces able to stop in the center spot? Or is it just a void area necessary to fill the board in? The center of the board may be passed through, but has no square to be occupied. Can you check mate one opponent first and then the other or no? If it works out that your pieces end up in such a way that both kings are in inescapable jeopardy, sure. Are the pieces sets light or heavy? I ask because in regular plastic chess pieces sets there is this two options. They're relatively light. They're no different than average plastic chess pieces and are not made out of heavy materials like wood or marble. If you cross 3-man chess with checkers what would you get? An entirely new game that doesn't exist yet but totally should. If a piece can arc around a board, can you make a move where a piece ends up on the same space prior to moving? It depends on the piece, but yes, it's technically possible. Is good to bring on a date? If you're the type of person who can date two people at the same time then you might not want to jeopardize your luck by making them play chess. Unless they're into that sort of thing, of course. It says "green lines prevent mayhem during the opening moves" does this mean it only last a few turns or the entire game? There are a few exceptions which are outlined in the instructions. You can view the complete instructions by clicking on the link provided in the "Features and Specs" section at the top of the page. This might sound crazy, but I wanted to play a game online, but there isn't a 3-man chess board already made. Could you kindly link a png of the board? We're sorry but we are unable to do that. We're also not sure if the manufacturer would approve of distributing an unaltered and completely intact copy of their board. Do you offer replacement chess pieces for the three man chess? No we do not. With that in mind, the pieces themselves are not any different from the ones you'll find in any other chess set. You can use any chess pieces you like. Can we buy Three Man Chess without the line thingies? No, but if you were so inclined you could re-paint the board to your liking. The lines are actually quite important and make it much easier to see how pieces are able to move. Is it considered checkmate if player 1 traps player 2, but player 3 can save player 1 by taking player 2's piece? Not if he can be saved, but that would be up to the other player, wouldn't it? Do you know where chess was invented? The original game of chess? The earliest version of a proto-Chess game is believed to have originated in or around India some 1700 years ago. The game as we know it now is the result of centuries of modifications and changes to that game. If i move using a diagonal move, can i keep on switching the line of the diagonal move direction ? I'm not entirely sure if I understand your question. The movement of the pieces is exactly the same as in regular chess. Does the moat eventually open or something? No. The purpose for its existence is to prevent players from immediately attacking one another at the edge of the battlefield rather than in the middle. You can choose to ignore this rule, but I think you'll find the chaos to be less fun than you imagine. Are the pieces made of glass? They are not. The pieces are made of molded plastic, however you can use whatever chess pieces you already have. Can you castle in Three man chess? Yes, all of the standard plays and rules can still be used. Is Three Man Chess magnetic? No, the pieces are not magnetic. In regular chess, once a pawn can become any piece. How does it work on this? Precisely the same way. The rules regarding pawn promotion are the same as they are in regular chess. You still need to reach your opponent's side of the board. Plastic and thick carboard similar to conventional chess boards. No, it isn't. Once a player has been checkmated, they are out of the game entirely. Their forces cannot be commandeered or returned to the defeated player. The pieces simply lie motionless on the board for the duration of the game. Is the moat uncross able threw the hole game or just at the start. The moat cannot be crossed at all. Can you go to anther base in 3 man chess? I don't know if I understand the question. If you're asking if it's still possible to maneuver a pawn to the other side of the board, the answer is yes. If you're asking if you can start attacking your opponent from the beginning by moving horizontally, the answer is no. Can you use regular chess pieces? Absolutely; the pieces are exactly the same. The only thing that has changed are a few of the rules and the board itself. Will there be a chess game with a higher number of players down the line? Say, 9-player chess? I suppose anything is possible! Could you make 4 man chess? Its called 3 MAN chess, can woman play this? This game is played a lot at our school during the breaks. Unfortunately 1 of the pieces is missing. Is is possible to order 1 spare part? We're not the manufacturers, so we aren't able to provide spare pieces, but Three Man Chess uses regular chess pieces. You can scavenge one from another set or purchase one from almost anywhere games are sold. What happens when one side is checkmated? or when they lose the king? do you remove the pieces of that Color? or does something else happen? "Upon being in checkmate, the player's remaining pieces (including the king, if applicable) remain on the board as inactive "corpses" which cannot attack or move, but may be captured freely by other players for positioning needs. Checkmate is not reversible, even if an otherwise legal move presents itself later in the game." All of the pieces move the same way as their traditional, two-player counterparts. The same as he would normally. The instructions that are included with the game make this very clear, but the central circle is not its own space. The lines on the board would assist with the direction of the pawn's diagonal attack. Isn't the rook able to just go around in a circle and defeat everyone? Nope. The rook would be unable to attack left or right until it was beyond the green line. It cannot immediately attack behind enemy lines. What are the lines on the board for? The lines act as guides for pieces that are able to move diagonally, such as Queens, Bishops, and attacking Pawns. How much would it cost to ship this to Bedfordshire England? 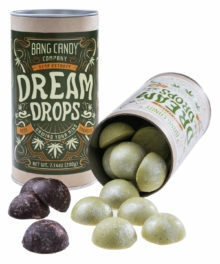 In pounds preferably, but you can give it to me in USD instead if you want to. The cost of shipping, as well as the estimated arrival time, will depend entirely on the shipping method you choose when you check out online. You can click the “Shipping Calculator” link near the top of the product page for shipping quotes. All prices are listed in USD, but you can use Google's built-in currency converter to find the exchange rate. Can you use it also a 2 Man chess board? My friend and I are complicated! Not really. A regular chess board would probably be better for that purpose. Can a piece can be kinged? And if how? Pieces are not "kinged" in chess. If a pawn is able to reach the other side of the board (his opponent's starting position) then the pawn can be promoted to a rook, bishop, knight, or queen. Can you make four man chess? Maybe someday! In practice, wouldn't it be the same as setting two chessboards next to one another? The knights still obey the same 2 & 1 movement as in regular chess. If you move a piece that was check mating an opponents king, does the player that was in checkmate get to move again? No. A checkmate will effectively defeat your opponent's army, rendering them immobile for the rest of the game. What happens to a players chess pieces when there in checkmate? Do they stay as obstacles or what? Here's the surprisingly grim instructions directly from the manual: "When/if a team becomes CHECKMATED, that player is out. ALL remaining pieces remain on the board dormant. They lie as dead fossils, without even a decent burial from the useless government they once supported. The square that one of these corpses consumes may be captured by another team's piece if it wishes to occupy that square." Is the game over if one player gets checkmated? Not if there's still another opponent to worry about! It depends on the piece in question and the move you're attempting to make. It's difficult to explain and describe the many different movements possible in a game of Three Man Chess, but we promise that the included instructions are very clear regarding how the attack should be performed should any doubt arise. Probably! Here is a list of all the countries to which we currently offer shipping. We're not going to lie, the layout of the new board does take some getting used to, but I don't think it's any harder than two-person chess. The difficulty will ultimately depend on how good your opponents are. what are the pieces made out of? Are the pieces weighted at the bottom? The pieces are plastic and have felt bottoms. They aren't weighted at the bottom, but they aren't so light that they'll go flying around either. It actually works out better this way. A square board would not have lined up correctly. how did you think up the round chess board? We're not the manufacturer, but a spiral is a lot easier to manipulate than a square. Can I be able to know the amount of time for this item to get to my country and how much it would cost? Yes you can! Simply add the item to your cart and once you've filled out your shipping information you will be able to see the different shipping times and prices. Can you make a 5 player chess? Unfortunately, we do not manufacture our products. Sorry! Traditionally white goes first, but that's ultimately up to you. It looks hard when you here about it? Does the product have instructions? Yes, instructions are included. The game itself really isn't that complicated, so if you know how to play chess then you're almost ready to go. How does a pawn change into another piece? Does it have to get to the edge of 1 persons side or the middle? The same as before. In order for a pawn to be promoted, it must reach the opposite side of the board. Do the pieces have weight to them? If they didn't they'd float away! They're not heavy if that is what you're asking. What is the age rating? There isn't one. Three Man Chess, just like its ancient two-man predecessor, is appropriate for all ages. Could you combine two boards and play six-man chess? Not in any official manner. All of the pieces still use the same movements from a traditional game of chess. Will you ever make 4-man Chess? Maybe someday, but I think that would be as easy as simply putting two chess boards next to one another. Thanks! It may someday be available with a wood board, but we do not have any idea if it will happen soon. I dont get the knight move in 3 man chess. It's difficult to explain in this format, but the included instructions are very clear about how the pieces move and what adjustments must be made as a result of the new board. Why giant circle instead of square? Square is much easier! Not when it comes to threes, actually. A square board would not have lined up properly. The movements are the same however some of the rules are a little different. The included instructions are very clear about the changes made. How do we know which two players end up in checkmate? It should be fairly obvious when a checkmate occurs if you're familiar with the rules of chess. There really shouldn't be any question about whether or not a checkmate has occurred. Is it possible to get each player's kings to be in checkmate with each other? Example, black checkmates grey, grey checkmates white, and white checkmates black? No, that would not be possible. Do you ship to Malaysia and what are the charges to Malaysia? Yes, we ship internationally. The cost of shipping will depend on the shipping method you choose during checkout. Click the “Calculate Shipping” link near the top of the page or simply add the items you want to your cart to see shipping options and prices. How does the Knight go? The same as always. The movements of the individual pieces have not changed. Can I also play with one friend instead two? In that case you would need a normal chess board. Do you have plans to carry different types of board? Perhaps a wooden board? We don't plan on carrying any different models at this time. If you'd like to buy one and make your own based on that, be our guest! The third colour is grey right? Correct. The armies are White, Black, and Gray. can you add a feature like trapdoor checkers, to make it even more awesome? also, what happens if you lose a piece? are there extras? No, there are no plans to sell extra pieces or include trap doors. Sorry! Is it just me or is not having a life one of the funnest and most awesome things ever? I suppose it depends on what you mean. I have a lot of weird hobbies and am accused of not having a life, but I'm pretty happy with it. How does a knight MOVE? More or less the same as before but with a few new exceptions. It will largely depend on where the knight is on the board and the conditions surrounding it, but these new rules are described in the included instruction sheet. No, this set does not have special pieces. Was this inspired by the 3-Man chess created by Sheldon on the Big Bang Theory? No. This game actually predates that episode by about 6 years. Not really. It definitely takes some getting used to, but if you're familiar with how to play chess it is easy to pick up. Are the pieces of 3 person chess from The Big Bang Theory in this game? Ie. old woman, serpent, beekeeper, pope, go cart, time machine, jetpack etc. No. Not only is that version fictional, but it was wildly difficult and impractical. The reason why it was funny, as we see in other episodes, is because Sheldon tends to overanalyze situations to such an extent that he misses the obvious solutions. Maddening jigsaw puzzle lacking a distinct image.